Consort Frozen Foods have issued their biggest ever promotional catalogue! It's so big, the couldn't even send me the file! There's got to be something for you! 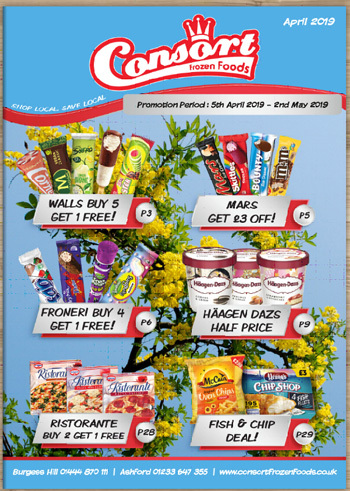 With Spring in the air we hope that you are all set for a bumnper month of ice cream and frozen food sales. If it's a good deal on frozen food that you're looking for, then our Ristorante buy 2 get 1 FREE deal is where to start! There's also a Fish & Chips meal deal and our special feature on Aviko potato products including free POS and gift. There are just too many deals and products to highlight any more here, so have a look inside and fill up your freezers. In addition to the above we also sell a large assortment of point sale material, cups,straws, cones and sprinkles. Just ask one of our sales team next time you speak to them. Click on the image for a link to the brochure (no big file this time) or follow the link below to get Consort in touch with you now!